Personal storage is a term you should become familiar with if you value your data. Obviously no one wants to lose critical information but where to store that data has always been a question. Thumb drives are portable but easily lost and cannot be expanded beyond their original capacity. Storage on the web is limited and sometimes raises security questions. Hard drives can be secure but are prone to failure and not easily configured for fault tolerance. So how do you store your data securely, safely, with ease of access and with options to grow as your needs do? Companies earn big bucks addressing this concern for businesses and consumers. The problem has not been one of choices but one of simplicity and dollars and cents. You want secure, safe, and easy storage that doesn’t cost a fortune. Now that limits the choices. The answer has never been so simple… The EX4 Personal Cloud Storage System by Western Digital. 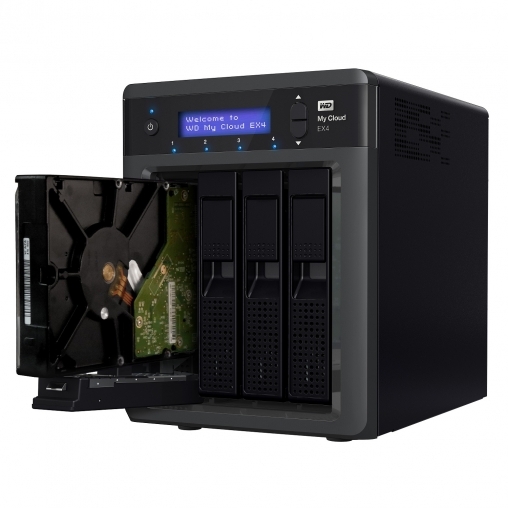 Western Digital releases today the EX4, a storage system that redefines simplicity, power, and features. This shoebox sized device aims to respond to your needs and then some. TechwareLabs was invited to a private product briefing with WD just a week ago on the EX4. The invitation was appealing with a half concealed product behind a curtain alluding to the potential of more to come. Over the next hour we were briefed on a startling simple storage device that meets every need we could conceive of for a product in this price category. The two most interesting things about the EX4 are its simplicity to use and staggering number of powerful. We have tested storage devices for years at TechwareLabs. So many devices and designs that its easy to lose count. TheEX4 immediately presents itself out of the box with a professional appearance, good design, and good price. The EX4 is meant for the home consumer or small office or business. Although an entry level product, the EX4 is remarkably robust in its feature set. Like many storage devices it has a web based interface that allows you to configure the device. In the case of the EX4 it sets the bar pretty high for all other storage devices, even many in the enterprise category. User interface has only recently become an area which manufacturers are interested in seeking refinement and ease of use. As you can already tell, we like the way the EX4 interacts with the user. The interface is clean, logical, easy to use, navigate, and configure. As a testament to this the device took a grand total of 5 minutes get unpacked, installed, and start using. Plugged in and turned and fully booted we dove right in. Let’s see what we found. Thanks for the great review of the WD MyCloud EX4. I had a similar type of system I purchased years ago called the LaCie 5Big. It had 5, 1.5TB hot swappable drives with auto backup, Raid, etc,. It worked great for years until it experienced it’s first power failure during a local storm. Upon power up it went through a rebuild mode which ended up corrupting all the data. After a very expensive data recovery I reloaded the unit, ran the system again and tested a simulated power outage. Same result. LaCie tech support had no solution other than to suggest a UPS and to do a controlled power down in the event of an outage. I did have a UPS connected but once it runs out in the middle of the night, unmanned, the resulting failure scenario remains. I know you did a network failure test but did you happen to do a simulated power outage test on the WD EX4?